It was so nice to have tea and cookies with all the St. Dunstan's Quilters again. It's been quite a while since I've visited them. I was sad not to see Rose there. She's my usual main contact, but she is sick and not able to attend quilting for a while. But we carried on with the task of choose what the next raffle quilt will be and tried to consider what would Rose like in our process. So, after going through lots of pictures, and every bookmark in the books, the ladies came upon a decision. Because they think this is going to be much easier and quicker to quilt, they chose the Weed Wacker quilt by by Bonnie Hunter. This is Bonnie's quilt. It's really got a unique look. The ladies were quite excited about it and want me to do it in earth tones. Browns, golds, greens, burgandy's. I'm excited to get going on it too. I haven't decided whether to make this in a very scrappy style with 15 - 20 fabrics or just do it less scrappy 9 or 10 fabrics. I'll make a sample blocks this weekend and decide after that. I'll soften the border and do something a bit lighter - maybe some fall leaves and vines on cream borders... . And they're not crazy about the Weed Wacker name, so they want to come up with a autumn themed name for the label.
. I'm excited to do this one as it's been on my to-do list for a long time. Many thanks Bonnie Hunter for this fun pattern. 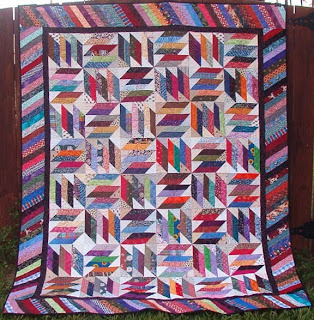 Bonnie Hunter's quilt is beautiful. I am sure it is going to be fantastic in the chosen colours, looking forward to seeing it! Beautiful. Maybe you could put climbing roses in the borders and you could call it Roses Quilt. And another GO to win! Do you want to win a GO! I Spy with my little eye - Where's Dora? 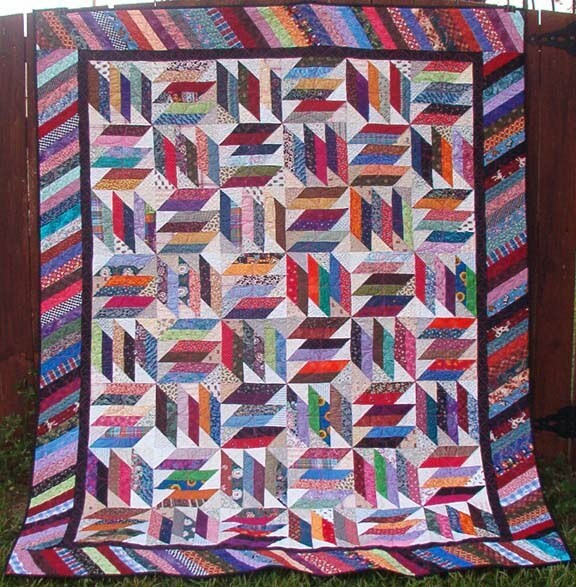 How would you machine quilt a Hexagon quilt? Ask me what's in my Werther's Can?